It’s been a while since I’ve posted about my pink journey here so I figured I’d do an update. I am one month out now from the completion of radiation treatments. My skin is healing nicely and I don’t have any real issues with my skin now other than being dark on my shoulder in the radiation field. I also have been dealing with my muscles tightening up in my arm and hand on the radiation side. I continue to do stretching exercises to try and relieve that situation. I started taking Tamoxifen today which I’m a bit concerned about this drug therapy but I know it is necessary as my cancer tumor was estrogen positive and I have to make sure I don’t feed my cancer. I am concerned about all the side effects with Tamoxifen but I am reminded that this whole thing is out of my hands. I need to leave it all in the healing hands of our Lord. So overall I’m doing pretty good and just wanted to let everyone know how I am doing. My hair is growing back but at a very sloooow rate. My hair has always been fine so all this chemo hasn’t been good for my hair. But it is growing and I hope by Christmas to have a little “do” that I can display so I don’t have to continue the knit hat and ball cap routine. More later, until then thank you everyone for all your wonderful warm thoughts and prayers. In support of Bloggers Unite Day, I am putting aside my crochet hook and my recycled bags to blog about an important cause. On November 10th, thousands of bloggers from around the world will unite to raise their voices on behalf of more than 40 million voiceless refugees. We blog to bring attention to this crisis and to join hearts and minds to help bring forward information, understanding and action. Refugees United is a non-profit organization that helps refugees relocate family and friends through the use of the internet. Refugees United provides refugees with an anonymous forum to reconnect with missing family. By registering with nick-names, scars, former locations and other markers only identifiable to family and close friends, everyone can remain ‘invisible’ to all but relatives. * All refugees are welcome, regardless of conflict, place or time. * Refugees United is an independent, non-political, non-religious NGO. * No third party is involved. No official papers need to be filled in. * The service is free of charge, easy and safe. The Refugees United search engine is the first of it’s kind. Visit Refugees United to see how it works and to learn more about the work that Refugees United is doing. I have been working on a project of crocheted towel toppers. I wanted to be able to create the topper without cutting and eventually not having to machine sew the top of the towel. Another goal of the project was to have a double layer 2-ply towel. Here is my first finished double towel topper below. Here is a picture tutorial and free crochet pattern below for making a double towel topper. Fold the towel in half with right sides facing out. Machine stitch along the top edge using a basting stitch. Then using some cotton blend sport weight yarn and a steel #7 crochet hook, single crochet along the top edge through both layers of the towel. Here is another method I used where I did not machine stitch along the top edge. The steps are fold, press, pin, and then single crochet along the top edge of the towel through both layers. Again I used a steel crochet hook #7 to poke the holes for the first row. Then I switched to a “G” crochet hook after the first row to finish the towel topper. Finished no sew double towel topper which I call the fold and pin method. I have been working on this market bag with a netting type look. The bottom is crocheted with a Half Double Crochet stitch to give it a nice sturdy base. The bottom is also expandable up to 7 inches which provides lots of room for those larger items as shown. I designed this recycled tote bag to be used for a grocery market bag but it would also be an outstanding beach bag. Please enjoy this market bag project! Pictures are clickable to view full-sized. Does your Barbie need a new red dress? If so, here’s a little number I crocheted using some scrap yarn I had. I’m actually experimenting with this pattern to crochet a Barbie dress using recycled plastic bags. I wanted to test the pattern first using regular worst acrylic yarn to see how it looked as it’s easier to frog with yarn than with plarn. My first attempt with the pattern resulted in this little red dress for Barbie. The picture is clickable if you want to see an enlarge photo of the dress. I will now attempt another dress using plastic bag yarn with a few minor changes. Anyway I did write up the pattern and wanted to share this free dress pattern with everyone. For many of you that have been following me or my blog site, you will recognize this bag immediately. It is my avatar that I use for all my postings and to identify me on many of the crafting and social websites that I participate at. It’s one of the first recycled bags I ever crocheted. It represents my beginning in what has become such amazing journey. When I first started making recycled bags, I couldn’t find very many patterns and there was not much information out there on the process. Through trial and errors, I began to create many different projects using plastic bags, vcr tape, cassette tape, denim, and other recycled materials. My goal was to have a one-stop website where people could come and learn and share ideas about recycled crafting. Oh and I wanted everything to be free so everyone could take advantage and enjoy what I call green crafting. Anyway that is basically my story about the origins of my recycled bags. So today, I share with you my signature recycled shoulder bag pattern. It is a bit ironic but I had never written up this pattern or posted it here for everyone’s use. It is like coming full circle as I share this pattern now. As always I hope you enjoy the project and happy green crafting to all! My radiation is finished today. I completed 33 treatments of radiation for breast cancer including the boosts. I post a picture of fireworks as an illustration of celebration but it’s also how hot of some of my skin feels. The worst of my skin is my shoulder blade area and under my arm. Recall your nastiest sunburn and that might help you understand how red and raw my skin is in places. I’m told these areas are typically the worst for breast radiation patients. I post a picture of fire to represent how my radiation feels today. It’s like a fire under my arm and especially under my armpit. I have one more full breast radiation treatment on Monday and then I have my boost. The boost is just radiation to my tumor bed so my armpit will get a break — Yahoo. I need this break so much and will be very happy to be done with my radiation a week from Monday. Until then, please be patient with me as I haven’t been able to do much crocheting lately and haven’t had any new recycled patterns to share with you this week. For all you rug lovers out there, I have a new recycled plarn rug pattern to share. It’s crocheted in the round and I used several different shades of creme, tan, and brown bags to create an earth tone look. These plastic rugs crocheted from recycled plastic bags make great boot or doormat rugs as you can just hose them off and hang to dry. Remember do not put these in the dryer as it will melt the plastic. 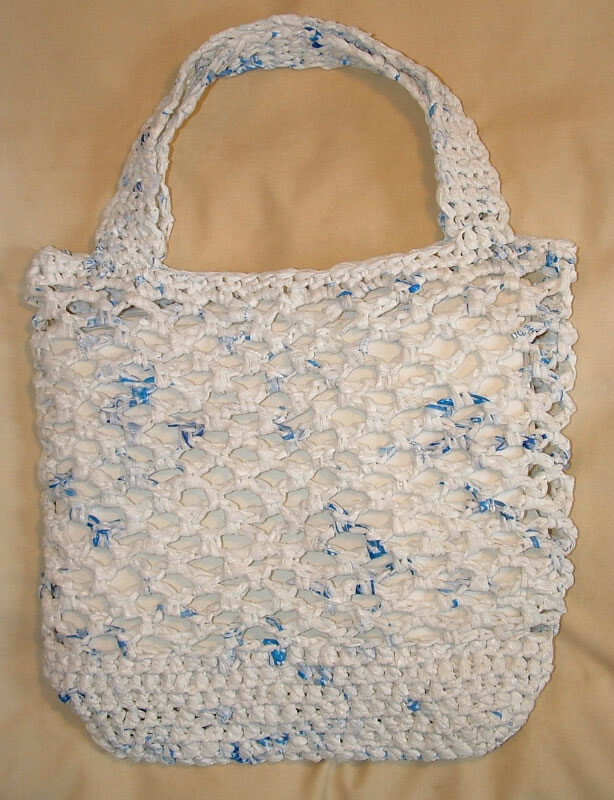 So grab those plastic bags, a big N crochet hook and lets do some recycled green plarn crafting!